It's no secret that young children spend a good time of their lives sleeping. Style, safety and comfort are often our major considerations when it comes to choosing the right bed. If your child is ready to graduate from nursery crib to toddler bed, it is a good time to begin the planning process to find just the right piece of furniture for this memorable stage. The crib and bed is often the main fixture in a nursery both for the design of the room as well as the most practical piece of furniture. While the bedframe is important, you should also give a lot of thought to the mattress you end up buying. Mattresses come in several sizes, and the one you choose should fit your child's bed perfectly, as a mattress that's too big or small may result in inadvertent falls or possibility of head injury. If the bedframe in the nursery is not of standard size or depth, it is a good idea to take the specific measurements with you to the mattress department store. Many experts suggest pairing up a mattress and box spring to help achieve maximum support. A mattress alone can lead to position discomforts and posture abnormalities over time—this is especially important because toddler's bones and muscles are developing and easily impressionable. When shopping for a good mattress, you might even want to bring your toddler along and see if he can maintain proper body alignment when lying down. While mattresses and box springs together can be somewhat pricey, it beats having to deal with a floppy or unhygienic secondhand mattress. You can try out store sales for good deals on kids' beds, or you can check out Oeuf brands, which give you great value for your money. Oeuf has noteworthy mattresses and beds that should go well with your nursery, as well as help your toddler get a good night's rest. The Oeuf Pure and Simple Dual Firm Crib Mattress offers extra support. You can also have both of the best—one side is firmer than the other, which is ideal for toddler use, whereas the softer side is better for infants. It's a cost-effective choice, especially if you get this early on for when your child was younger. Other than that, the mattress is lightweight and the material is breathable. Natural cotton cover is soft on skin and provides effective cushioning. Made of organic, plant-based foam, this non-toxic mattress isn't very likely to cause your toddler any allergies. On the other hand, if you want just one type of mattress, you can always opt for the Oeuf Pure and Simple Organic & Natural Crib Mattress. It offers all the perks of the dual firm mattress minus the dual firmness. Choosing the bed frame for your toddler bed includes safety checks. For instance, while at the store, ask what kind of wood the bed was made of, and if the chemicals used to make it are potentially toxic. Inspect corners and joints for any weakness, or creaks. Also make sure that the whole frame is completely painted over, because any rough spots might cause injury. The Oeuf Classic Toddler Bed has a dependable solid wood base that prevents any slipping. As usual with Oeuf, the unit exceeds mandatory safety standards. The side guards also make it easier for your toddler to get in and out of bed easily, while preventing falls when he sleeps at night. If your child prefers a bigger bed or you would like a piece of furniture that grows with your child for many years to come, the Oeuf Sparrow Twin Bed is a good choice. It's larger than the standard toddler bed, but should do just fine in terms of comfort and support, not to mention your big boy or big girl will love having a room that represents reaching that next stage in style! 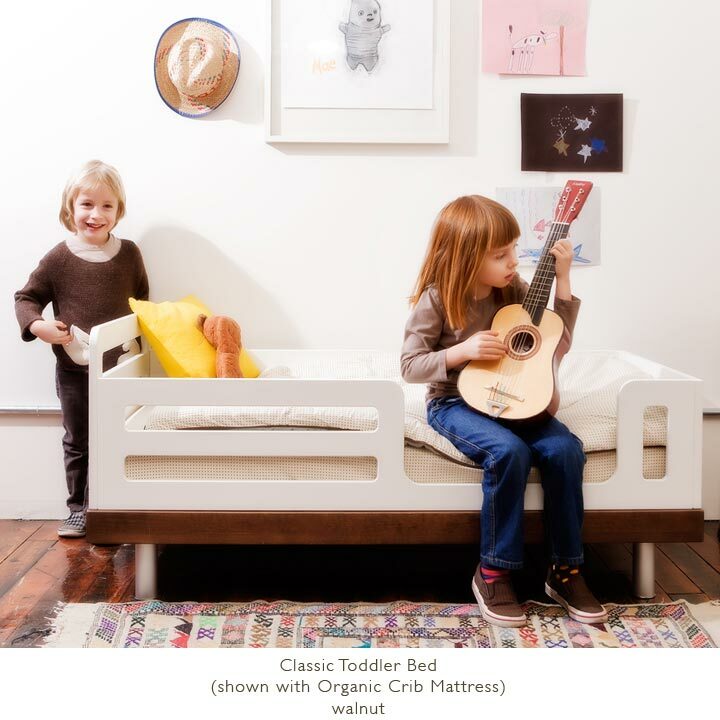 Oeuf even takes it one step further with the Oeuf Sparrow Trundle Bed, which is an extra storage space designed for attachment to the Sparrow twin bed. While conventionally used for extra sheets or pillows, the trundle bed can also fit a mattress inside it, in case you or your child need the extra sleeping space for that overnight sleepover with their new best friend or when that family guest comes into town. For older children who share a room and can handle climbing up and down ladders safely, consider getting the Oeuf Perch Bunk Bed. Made of durable Baltic birch plywood, the rails are well-built and designed to last over constant, long-term use. The bunk bed is built lower to the ground than most conventional double decks, making it a lot more ideal for children. The design and style of this bunk bed cannot be matched in the industry. At a great price point and a modern design that adds to the home rather than taking away from it, the practical space saver will delight even Mom. Affordability should be a factor when deciding on your child's bed. While it's good to aim for the mattress or bedframe that cost the least, don't compromise on quality either. In the long run, well-built (albeit pricey) products designed to last are the more cost-effective choice and a style that you can appreciate for completing the design of the home into every room.